In part one, we established that characterization in mainstream American superhero comicbooks has followed a fairly strict path whereby core elements are established and rigorously maintained for a number of creative and organizational purposes. Even our example, Chris Claremont’s X-Men, a deeply interior story (at least in the relative scale of superhero books), does not escape this mandate. But what makes Claremont’s work interesting is that his style of characterization constantly runs up against this tendency toward formula and franchise, seeming to offer to his characters legitimate change and even conclusion, before each is snatched away by the established standards of the field of superhero production. from Uncanny X-Men #188, with art by John Romita, Jr.
Like many of his comrades, Nightcrawler has grown tired of the endless game of beat ‘em up associated with the superhero racket and is pressing for his mentor, Professor X to give him a honorable discharge. Similar sentiments are explicitly and implicitly echoed in the words and actions of his colleagues Wolverine and Cyclops. All three of these characters have been given what was denied Siegel primordial Superman: a regular love interest. In these transitional stories X-Men stories, Claremont activates the traditional, heteronormative conclusion typical of genre writing — romantic coupling — for all three of these protagonists, and almost on cue all three attempt to remove themselves from active duty of super-heroics. Perhaps none of these relationships are particularly interesting in themselves and unfortunately their representation often displays some of the more conservative and juvenile impulses in the series; in fact, a memorable issue (Uncanny X-Men #183), Wolverine arranges for his teammate, Colossus, to be beaten after the latter admits to infidelity and breaks his relationships with another teammate, Kitty Pryde. However, I am more interested in the acts coupling as traditional markers of conclusion, something that can never happen for formula characters, once again depicting Claremont poking away at his own organizational constraints. In Uncanny X-Men #172-3, Wolverine invites his teammates to Japan where he is be married to the daughter of a yakuza boss, Mariko Yashida. 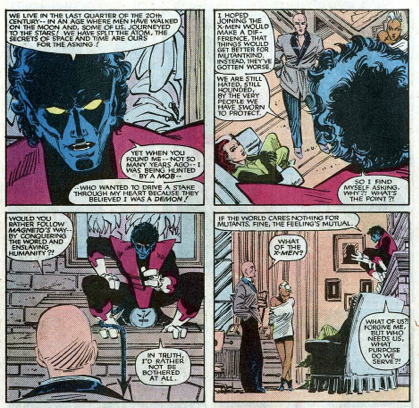 However, Mariko cancels the wedding at the altar, after being the victim of hypnotism and supernatural mental deception enacted by the X-Men antagonist, Mastermind. Strangely, even after Mastermind’s deception is revealed, the marriage is not re-considered. Mariko vaguely contends that she must attend to her deceased father’s unattended business. I argue that this rather flimsy, unsatisfactory and frankly illogical conclusion is less a product of unthoughtful writing and more a direct manifestation of editorial mandate personified in character action, preventing Wolverine from evolving, or much worse retiring satisfied — this just can’t happen, even if it means amending a flimsy excuse to set things right. The experience simply leaves the character of Wolverine even more damaged and tragic. If Wolverine is the most tortured character of the X-Men, Cyclops runs a close second, haunted by a deceased love interest who just won’t stay dead. His grief manifests itself in sociopathic actions and despondency, a majority of Cyclops subplots after the “Dark Phoenix Saga” depict the character constantly running away from the X-Men to start a new life only to be sucked back in. 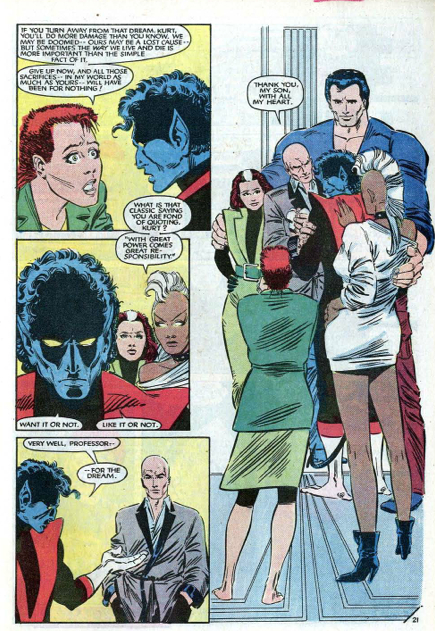 Almost as an act of divine grace and sympathy, Cyclops meets Madelyne Pryor, who at first seems to be an exact replica of the deceased Jean Grey. Mastermind, the antagonistic mutant with mind-altering abilities, tries to sabotage this relationship as he did with Wolverine, but is unsuccessful. Instead, Cyclops essentially retires from the X-Men, refuses a request from his long-lost father, Corsair, to travel with him through the galaxy as a space pirate, and marries Madelyne. From that point on, Claremont struggles to re-include the character — who wants nothing to do with the X-Men — back into this superhero series. Therefore, we see Cyclops and Madelyne inexplicably attacked by an angry shark and squid en route to their honeymoon (Uncanny X-Men #176). And the character is swept away from his new wife only through the very force of editorial mandate itself that literally transports Cyclops away from Earth for the Shooter-penned mega-event, Secret Wars. In other words, the character is done with the superhero game and is only sucked back by strange and deliberate efforts to disrupt his domestic fantasy. Of course, none of this was to be: Jean Grey is eventually resurrected, prompting Cyclops to re-don his spandex skinsuit. And, eventually, Madelyne is revealed, many years after the fact, as an imperfect clone of Grey created by another X-Men antagonist. The traditional conclusion of coupling offers no solace to the formula character and the tragic love life of Scott Summers continues. This editorial mandate for sameness and eventual return is frequently voiced by the “boss” of the X-Men, just as it was probably espoused to Claremont by his own real life bosses. Professor X emerges as the voice of editorial reason defending the rather flimsy mission statement of the X-Men themselves. Ironically, Professor Xaver is put through the same deep changes of Storm and through the processes of coupling as Wolverine and Cyclops; however Xavier actively and violently resists both efforts to disrupt his original vision for himself and his group (and for the series itself). During the same attack of space insects that incapacitates Storm, Xavier’s body is irrevocably damaged, forcing him to be re-spawned in a vat. This freshly-minted Xavier is the same, except for the physical disability that removed his ability to walk. Despite newly able legs, Xavier still cannot walk or move without his wheelchair; his mind prevents him from moving past his initial visual design. He is given an body, like Storm, but is unable to project a future outside of superhero iteration and, with the help of Rachel Summer’s dismal vision of bleak future that will and could never happen, Xavier narcissistically puts all his X-Men pieces back into place. Moreover, Xavier is given a possibility for change or even conclusion through traditional coupling, as Lilandra, the despotic ruler of the Shiar Empire — somewhere out there in outer space — begs the X-Men’s nominal leader to come with her back to home planet. Xavier returns the entreaties with reciprocal love, but refuses (unlike Wolverine who spurns the US for a new home in Japan and Cyclops who abandons Xavier’s school for Madelyne) to move from both his established place and role, giving vague arguments such as my students “need” me. Xavier in these stories, resisting the impulse to change literally embodies the regressive nature of superhero narrative imposed by its particular organization and economic identity, and imposed upon the work of Chris Claremont. Hey there! Found my way here from HU. I wish I had seen these two posts before I wrote my 3-parter on Storm (I posit a very truncated version of your argument here in looking at “Lifedeath” and “Lifedeath II” in an effort to make some other claims). Part One is here, if you are interested. Part Two goes live on Tuesday. Anyway, I wonder if you could use notes or interviews about specific choices mandated by editorial to bolster you examples. The thing I’d be interested in knowing (but fear there is not way to ever know/measure this) is the degree to which wariness of editorial oversight changes creators’ ideas and directions. We hear a lot about maverick writers and artists who were always butting heads with their editors, I am curious about the more internal struggle’s influence on the narrative and art work. now, that being said, i would love a chance to ask claremont about his experience and would relish hearing about it! Hey I am with you on textual evidence being our biggest resource, and that is where I develop most of my ideas from – close-reading connected to a theoretical framework that (hopefully) let’s us shed light on other work – but at the same time, I bet someone like Sean Howe (I hope you’ve read his EXCELLENT Marvel: The Untold Story book) would have a lot of info on ins and out and conflicts between creative and editorial that would be a start. I write a lot about continuity and identity in my work – and try my best to explore/describe/develop the implications of the weird mix of status quo and accretion of change in serialized superhero comics. As for my LNR work, most of it is in my as-of-yet unpublished first chapter of my dissertation, but I have an article that should be forthcoming in the Journal of Comics and Culture on Xaime’s later work. Though the next LNR thing I am going to write is about my favorite Love and Rockets X.
you have any interest in going to / presening at scms next year — was thinking about doing another comicsy thing and its always better to pre-constitute panels…??? How’d you know the piece was on Ti-Girls?